Diamond cluster rings were popularized by Queen Victoria, whose Sapphire engagement ring was surrounded by a number of small Round Brilliant diamonds creating a flower pattern. This style of engagement ring is still popular today, and works as well with coloured gemstones as it does with diamonds, and has been updated by using a variety of different diamond cuts as the central stone for a more contemporary feel. There has also been a rise in antique styles of engagement rings, featuring a central diamond surrounded by tiny bead or pave set diamonds for an “Old Hollywood” look. Other options for diamond cluster rings include bezel set diamonds in a variety of sizes and arrangements. Gypsy set or flush set diamond rings offer a contemporary option for engagement rings. These rings feature diamonds or gemstones that are set flush with the surface of the ring. 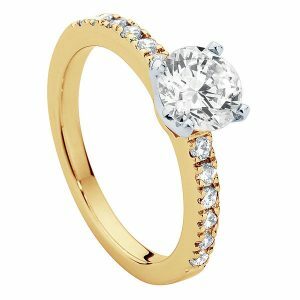 This style of diamond engagement ring is more contemporary and works well for people who work with their hands or prefer a band style of engagement ring to a ring with a raised setting. Pave settings use small diamonds which are set into the surface of the ring by tiny claws, creating a ring that looks like it has been paved with diamonds. Pave settings can feature diamonds of a variety of sizes, but are most effective with diamonds of the same size set side by side, or enhancing a central diamond or gemstone. Larsen Jewellery specialises in custom made engagement rings and can handcraft a wide range of unique designs. As we make all of our rings to order, your choice of design is not limited to the selection shown above. All the engagement ring designs shown on our website can be made with your choice of diamond or coloured gemstone, picked from a selection of loose stones, and in any metal, including White Gold, Yellow Gold and Platinum. 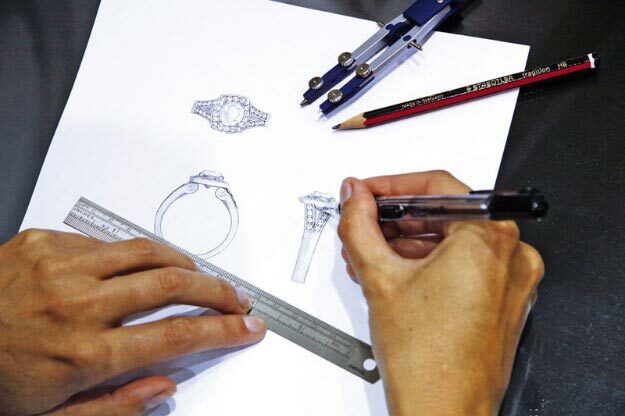 We welcome you to come in for an obligation-free design appointment with one of our jewellers who can advise you on choosing an engagement ring design to suit your individual style. We can also help you understand the 4 C’s of diamonds to ensure that you make an informed decision when choosing your diamond or gemstone.